Choosing a poor quality hosting provider in order to save a few euros has already cost several companies dear. Good quality hosting indeed requires a state-of-the-art data centre, which can guarantee both availability and security. But what should you consider when choosing a data centre? 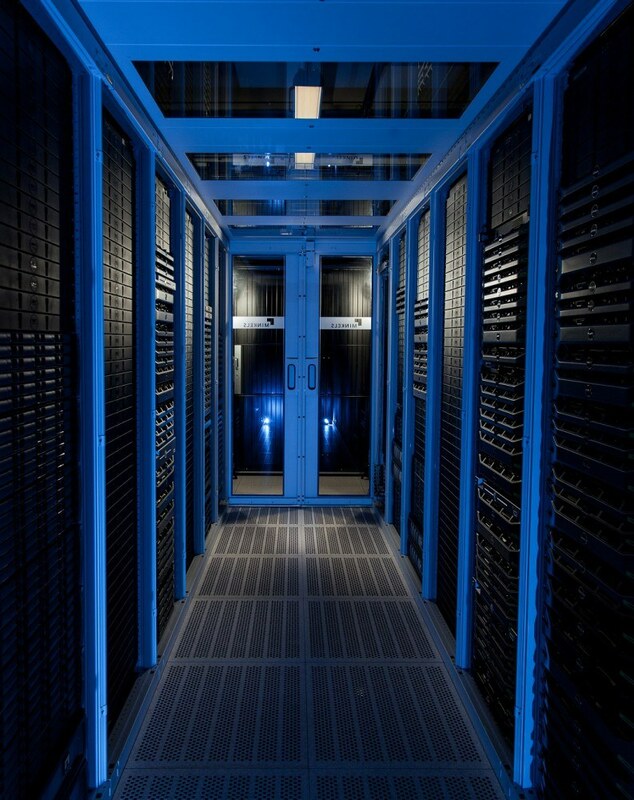 The Combell data centres can serve as examples of perfectly equipped server rooms. In an article published on Bloovi.be, you already had the opportunity to find out all the details about the data centresecurity measures that Combell has put in place in its data centres. We e.g. make sure no intruders can access the centre, thanks to a mantrap that allows only one person at a time in it. But we also take virtual security measures: in order to fight DDoS attacks, the data centre uses a large bandwidth. Everything has been thought through. A double-ceiling system has been designed to protect the server rooms against storm damage and leaking roofs. As far as fire safety is concerned, we use Argonite gas, which reduces the oxygen concentration so that the fire self-extinguishes, and the servers are not damaged by water used to fight the fire. Diesel generators, as big as ship engines, combined with UPSs, are used to take over in the event of a power failure. Obviously, you cannot predict disasters and calamities, but you can make sure you are prepared well enough to limit the extent of the damage, right? 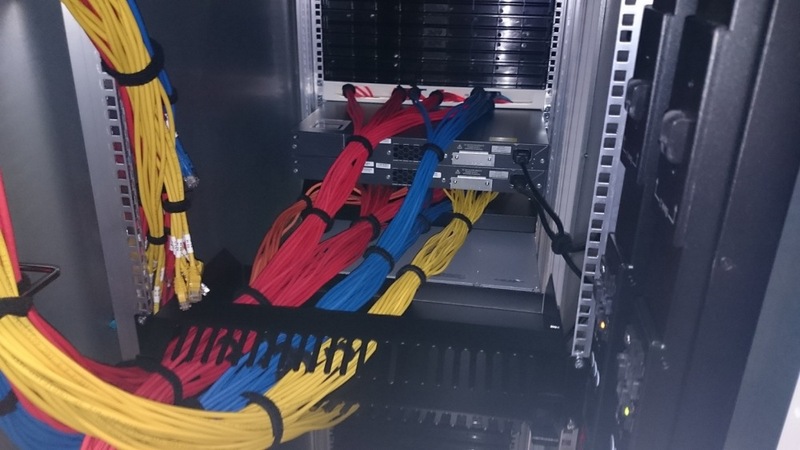 The rooms Combell uses for its servers are in tip-top condition, but the installations themselves have also been adjusted with stunning attention to detail and convenience – one might even say that they are exemplary for the data centre sector. The racks have been arranged thoughtfully, with remarkable meticulousness. They are 60 cm wide Minkels racks (the most common size). All rooms in the data centre are equipped with a Minkels Cold Corridor, which helps achieve efficient cooling. 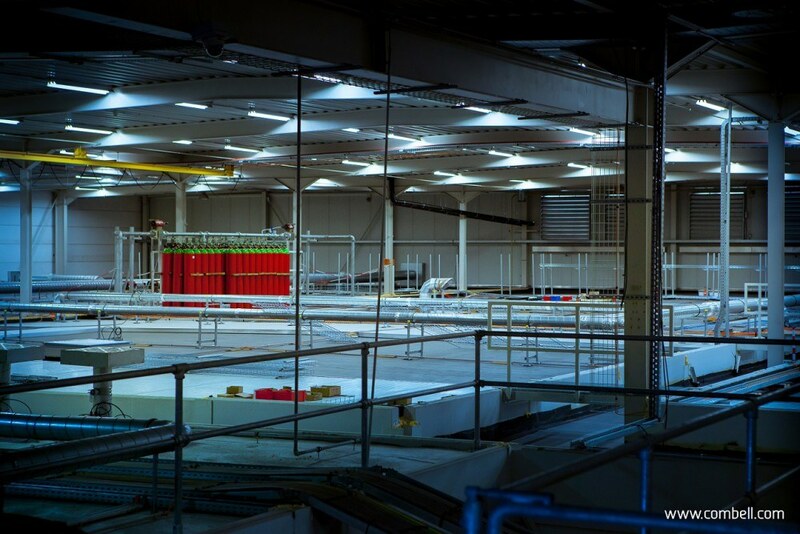 Cooling in traditional data centres is often achieved via a perforated floor, but this is not really efficient, simply because cold air does not rise. With the Minkels Cold Corridor, hot and cold airflows are completely segregated. The top part between the opposite rows of racks in the cold zone is indeed made of glass panels. In addition, the endings of the cold zone are sealed by sliding doors, so that cold air stays inside. Moreover, all racks are equipped with side skirts and filler panels between the machines, so that the air can flow smoothly around the equipment. Structured cabling, with consistent use of colours, accurate labelling, the right choice of cables, and an efficient placement of power sockets, forms the basis of a stable environment – just as the foundations of a building allow the entire structure to stay up. 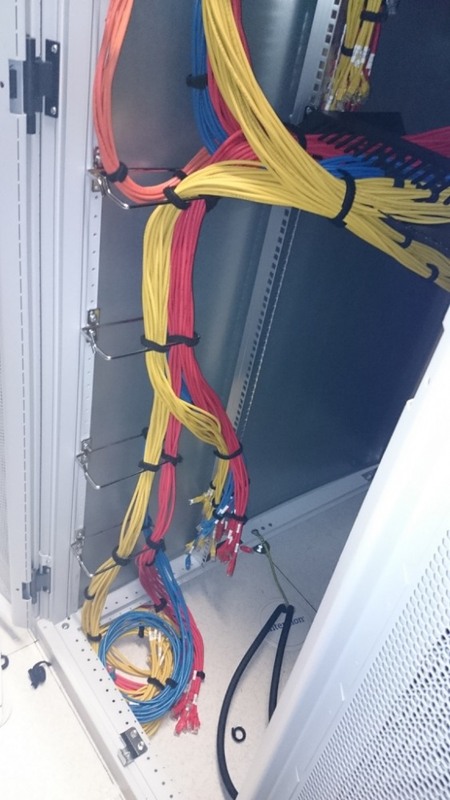 We at Combell use 4 different cable colours: red for access links, yellow for storage links, blue for management/console links and orange for uplinks. Two distinct cable bundles of each colour are created in the rack; one goes to the upper half of the rack and the other goes to the lower half, because we decided to install the switches in the middle of the rack. If they were installed above, chances are higher that there would be too many cables in the way in the upper part of the rack. Moreover, you would no longer be able to see the switches correctly, let alone replace them in the event of a hardware failure. Cables are placed upon delivery of the rack. We use the shortest possible UTP cables in order to avoid superfluous cables being in the way. By default, there are four lengths per colour: 1 m, 1.5 m, 2 m and 3 m.
Intelligent rack v3.0b: good thinking! A server can be mounted in a rack much faster, because everything is already set. The fact that our team members have sore fingers because they need to bundle so many cables together using Velcro ties does not scare us – what really counts is our pride as professionals! 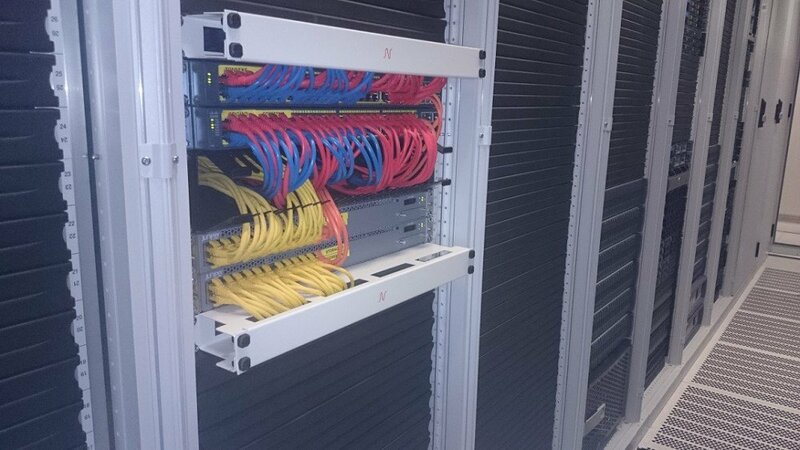 In short, a first-class data centre is immediately recognizable by the methodical arrangement of the racks and a neat cabling job. If you visit a data centre, you will be able to immediately separate the wheat from the chaff. If you ever get the chance to visit the data centre, you should definitely do it! How can you choose your data centre? Which Service Level Agreements can the data centre meet? Can the data centre offer the redundancy and uptime levels that you need? Is the data centre equipped with generators, UPSs and air conditioning tools to remain operational during a power outage or other calamities? In addition to software and hardware tools for data protection, does the data centre also offer physical security (video surveillance, electronic access cards, mantraps, etc.)? If you ever get the chance to visit the data centre, do it! Then, you will be able to immediately separate the wheat from the chaff. A data centre where you may hurt yourself stumbling on a pile of cables is a place you should avoid at all costs! Brute force attacks: how to protect yourself? Why is your SME afraid of the cloud?